During short circuit, circuit breaker contacts opens and automatically closes after few cycles to determine whether the fault is cleared. 90% of the faults occur in power system are transient in nature and lasts for few cycles and clears on its own eg: touching of transmission lines with each other beacause of wind, touching of tree branches to transmission line momentarily, etc. Such faults clears on its own and after the transient power system restores to normal operation. It is not advised to open the breaker contacts and isolate the line for such small transients. Therefore auto re-closers are employed which when relay senses the fault trips the circuit breaker contacts. After some time breaker contacts again try to close, if there is no fault in that instant power system restores to normal operation. However if fault further exists circuit breaker contacts open up permanently until it is reset. The cycles of closing and opening is designed for the circuit breaker depends on the application. For determining the making current of the circuit breaker we must multiply symmetrical breaking current by (2)1/2 to convert to peak value from rms value. and then by 1.8 to take into account the doubling effect of maximum asymmetry. 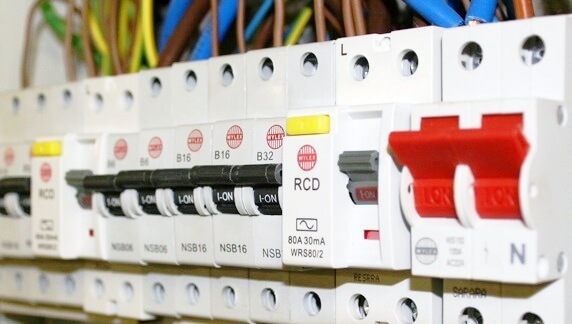 What is a circuit breaker ?